This is a picture showing how my father attached the new safety chains to my '69 Scotty. It's pretty slick and is how I am doing the safety chains on the '62 Shasta as well. It is a big bolt that goes all the way through the coupler. The chain links are between two large washers and there's a metal spacer between the washers and the coupler. 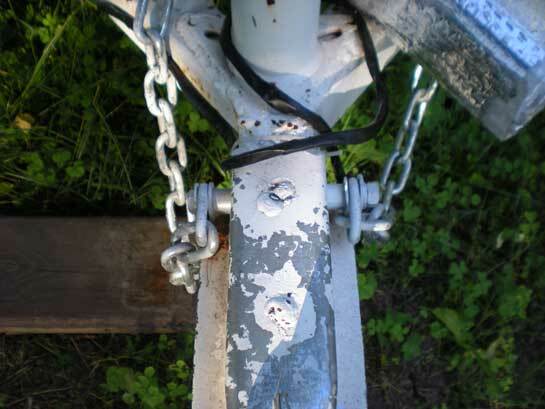 There is no slack - the chain links are firm and don't move loosely. 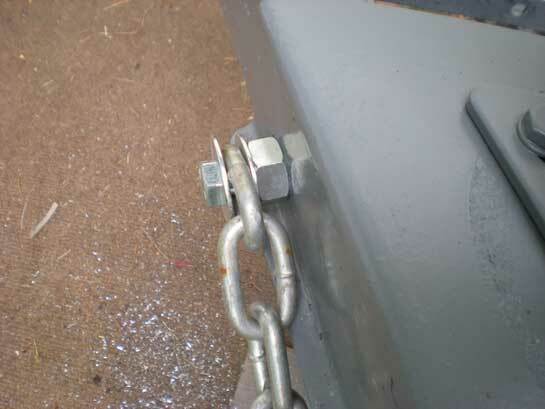 The purpose of safety chains is to keep your trailer attached to your car long enough for you to stop safely, should your trailer come off the hitch. Don't skimp on the chain or the proper hooks. Plain old "S" hooks and dog chain will not cut it. Buy the hooks that have the safety clasp on them. Bontragers sells a very nice chain with safety clasp for $5 per chain - so $10 for the set. It's a great investment. And, another variation. My hardware guy didn't have the spacer so suggested using a larger nut - one that the bolt just slips through, instead. Looks, and works, great!